This blouse has a timeless design featuring front tucks, puff sleeves, back zipper closure, and is embellished with buttons down the front. The blouse is perfect for an every day or for a special outing. ♥ Price is for the PATTERN only, not the finished product. This pattern was designed to be easy to follow. 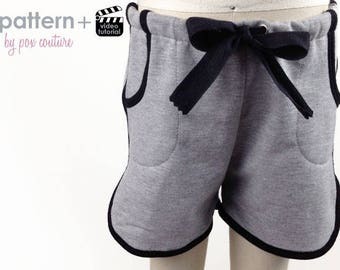 The PDF pattern includes sizes 2T-6, list of instructions, and a video tutorial explain all of the step required to make this garment. No SEGER needed. You will also receive a two pages of instructions on how to sew this garment, but its more of an outline, since the video will show you step-by-step instructions [https://www.youtube.com/watch?v=n1VH1tETY_E]. * Optional: You can make your own cording/piping. I have a bonus section in my tutorial that will show you how to make your own. Sewing curved seams, top stitching, applying fusible interfacing, hand-stitching. Please understand that due to the electronic nature of this item we can not offer refunds or exchanges. These patterns are for private use ONLY. 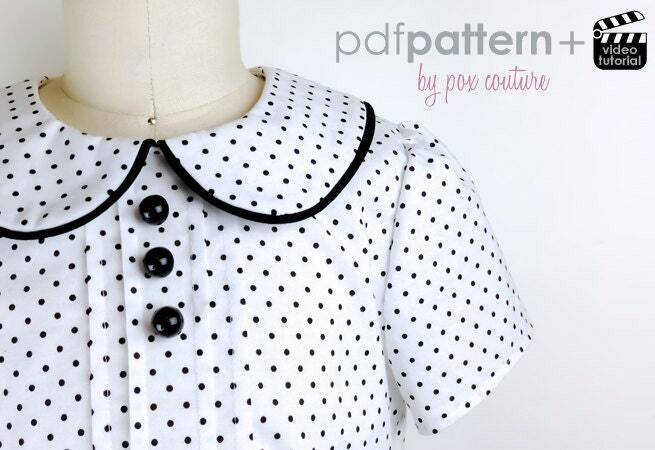 The images, layout, design and other aspects of this pattern are copyright © PoxCouture 2014. No part of this design or pattern may be reproduced in any form.